Here are a few of our favorite places to eat at in Oahu. If you like breakfast food, you'll love this place! Although it may be a bit of a drive just for breakfast, you can always hang out near Lanikai Beach or Kanehoe Bay afterwards. This little hole in the wall really has the BEST banana macadamia nut sauce pancakes! Take the 72 right to 61 right, right on Hamakua Road, make left at first little street, it curves to the right and Boots and Kimos is on the right just after curve, just past Napa Auto Parts store. Take in the rich cultural heritage of the Pacific Islands. Drink in the spectacular show delivered to you at the ocean's edge, under the stars and palm trees. Be touched by the magic of ancient Hawaii and its splendor. Enjoy the sense of belonging, where you are part of the celebration. Experience an authentic Hawaiian Luau like no other and discover why visiting us once may not be enough. Germaine's Luau, is quite simply "The Best". The Luau provides all you can dinner, entertainment, and drinks. Take the H-1 Freeway West . Follow signs to Waianae. Leave Freeway on Exit #1 (Campbell Industrial Park) , which loops over the freeway and proceed towards ocean on Kalaeloa Blvd . to the very end. Turn right on Olai Street and continue until the end of the road, ending in the Germaine's Luau Parking Lot. Park, lock, & proceed to Welcome Hale to check in. Approximate travel time from Waikiki is 30-45 Minutes. Directions: Look for the white truck on Kamehameha Highway (83) in Kahuku. Also in Hale'iwa. 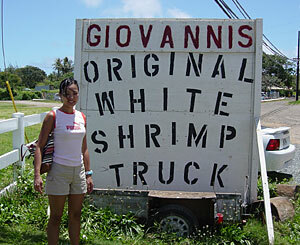 Hawaii's original white shrimp truck, Giovanni's has become a North Shore staple with visitors and locals alike. Recently chosen as one of Hawai'i's "Best Finds" by the travel buffs at Travelocity, Giovanni's has been serving up the tastiest Garlic, Hot & Spicy, and Lemon-Butter Shrimp for over 10 years. There will be numerous shrimp trucks before and after Giovannis', don't be fooled by the imitators! This restaurant is close to Ko Olina and is one of the best sushi places we've been to. It's located in a strip mall. The fish is VERY fresh and the prices are great! If you don't like sushi they also serve other Japanese favorites like Teriyaki, Udon, Donburi, etc. For a refreshing treat, try this famous north shore shaved ice shop. 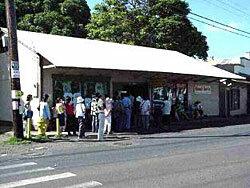 You won't miss it on your way to North Shore because you'll see people lined up from outside this little shop. The shaved ice is great because it's soft & shaved very finely so it melts in your mouth. Try any one of their flavors or a combination and of course include the ice cream &/or red bean. Their walls are filled with pictures of famous people that have stopped by. They even sell souvenir shirts! Roy Yamaguchi's Hawaiian Fusion Cuisine blends fresh local ingredients with European sauces and bold Asian spices, always with a focus on seafood. Each evening you'll find a tantalizing range of appetizers, entrées, fresh fish dishes and desserts. We really enjoy the fresh selection of seafood and Roys. Don't miss their famous chocolate soufflé! Many locations to serve you. Zippy's is like a Denny's for us in California expect they have Hawaiian, Asian, and Local foods. It's quite cheap and has a great assortment of foods. Some locations are typical of a fast food chain and others have a sit down option. 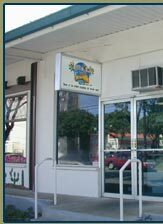 Some great eats that we like are: Saimin bowl, chili dogs, Hamburger steak, and chicken (moist & crispy). We admit we love 7-11 in Hawaii because they sell the BEST spam musubi. What is spam musubi? It's a rice ball with marinated Spam.